After an eleven hour trip, we arrived at Bangkok’s Suvarnabhumi International Airport at 7:30 am and a scalding breeze welcomed us as we left the plane. Nuno was afraid that they wouldn’t let us pass through the immigration port because we didn’t have a return flight. The process ended up being quite simple, some minutes in the queue, a smile from us, a photo and two stamps from them. We were officially in Thailand! Kob khun krap! Hopped on a train to the city center for 45THB in a 25min ride. The train is above ground which allowed us to see the city from afar. First the neighborhoods with terraced houses, separated by greens lakes, waterways and banana trees. Here and there the golden roofs of temples peaked from between the trees. As the city got closer, the train got fuller with quiet locals absorbed by their cell phones and sniffing on Vapex inhalers. 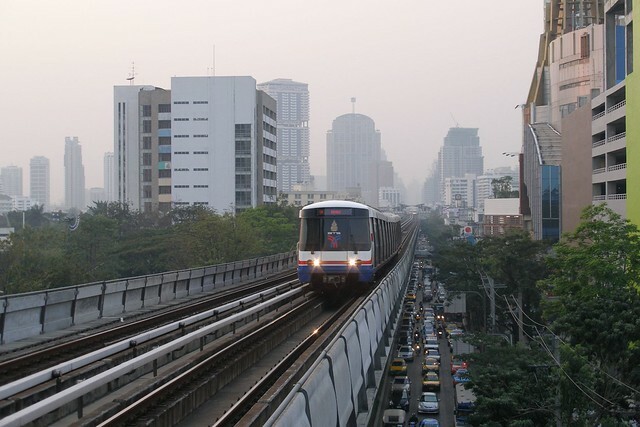 We left the train at the last stop (Phaya Thai) and started to feel the real city: traffic noises, new smells, thousands of locals in every direction and the unforgivable heat. We barely started walking and we were already sweating profusely. We got to Bangkok on a flight from Stockholm, so we were still wearing semi-winter clothes. After some minutes walking, we entered the first building that seemed to have air-con. It was a mall filled with teenagers and a nice food court, an opportunity to freshen up and grab something to eat. 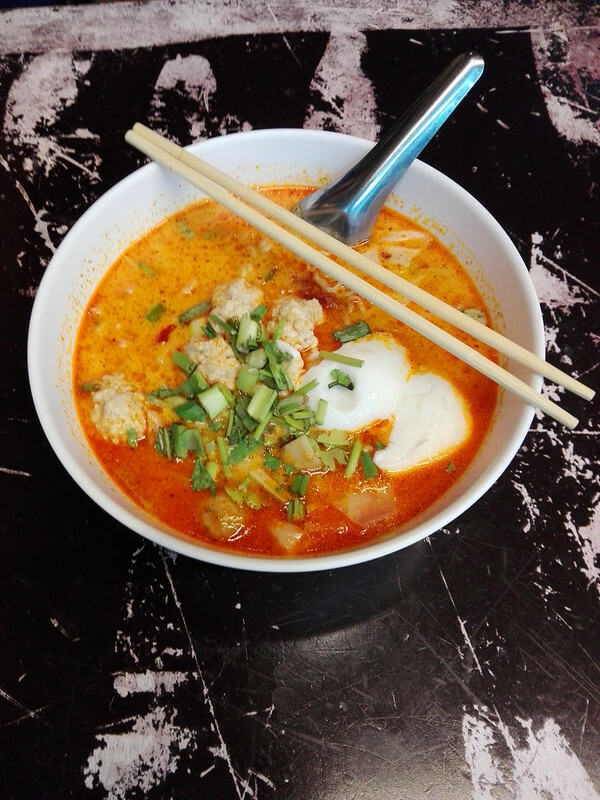 We ate Tom Yum Noodle Soup. With a full stomach, the journey to the hostel started. It was quite an adventure under the scalding sun. We walked and walked, turning and rolling the map* on itself, asking the locals for help, but getting back a smile and Thai gibberish that didn’t help at all. Every kilometer made the bags feel heavier. *You can get the city map on the airport at the Tourism Authority of Thailand for free. As soon as we found the right street a Thai guy approached us asking where we came from, how many days we’ll spend in Bangkok, and to where we were heading. He told us that being a Friday, some monuments were totally free and the tuk-tuks with the yellow license plates were cheaper and would gladly take us there. He also insisted a hundred times that we should go see the Big Standing Buddha. We just want to get to our hostel man. Not now. 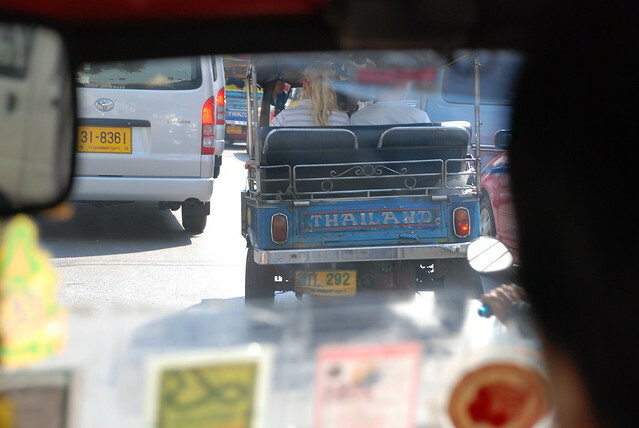 So here’s the deal: if you go to Bangkok you will get approached by tuk-tuks non-stop. 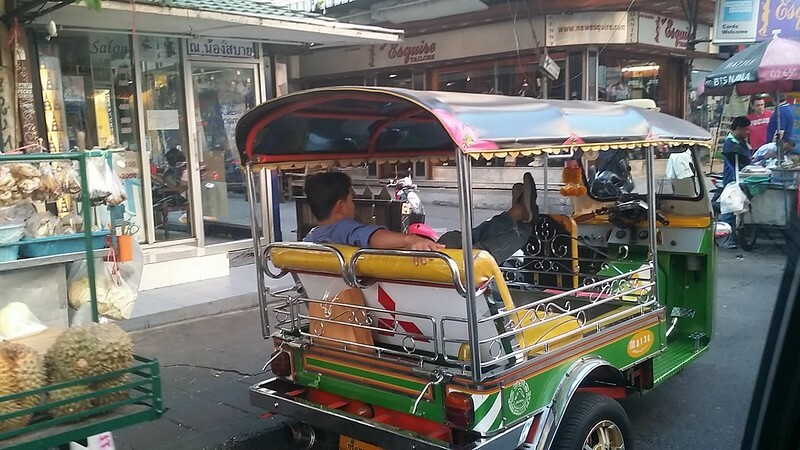 And if not by tuk-tuks, by guys working on commission for them, or for a store that makes money selling overpriced crap to tourist. Be prepared. – Hey ma’ friend. Where are you from? – When did you arrived in Thailand? – Nice beard. How long did it take to get it like that? – When are you leaving Thailand? Days later a tuk-tuk guy, after we refused his ride, actually lied to us saying the temple we were considering visiting was closed that day. After insisting on trying anyways, he sent us in the wrong direction, following us until we got completely lost, trying then to make the sell. Not cool man, not cool. And the funny part was that in the end, he just wanted to take us to the Big Standing Buddha. All of this persecution will make you feel like a Big Dumb Standing Tourist. 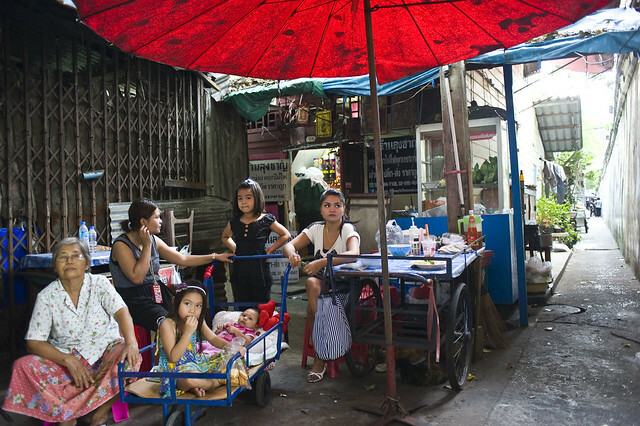 Bangkok is a worn down, full of life, hectic city. 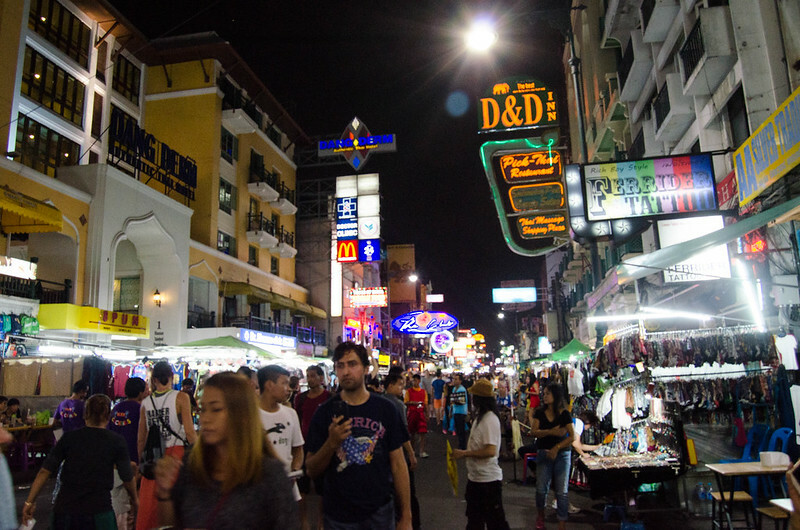 A reflection of that is the famous Kao San Road, a place for the ones who like to party. Neon lights, hundreds of tourists, street shops, vodka buckets and loud music from the bars constantly competing with each other. Parallel to Kao San is the mellow and bohemian Rambuttri Road. 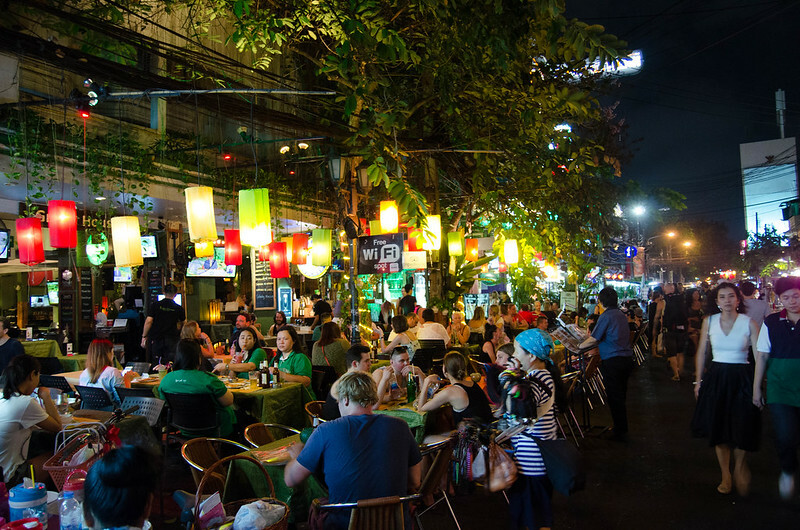 Good music, plenty of street food, fruit sellers, cool restaurants, nice bars, lighted trees, and plenty of Thai massage spots. It’s a great place to have dinner and spend your evening. 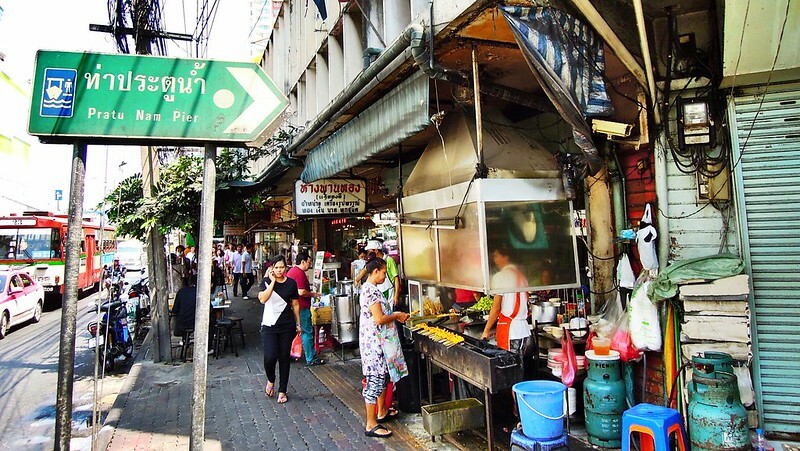 Thailand is renowned for it’s cheap and delicious street food. It’s everywhere at any time of day. You can have a delicious pad thai from 50 to 80 THB. 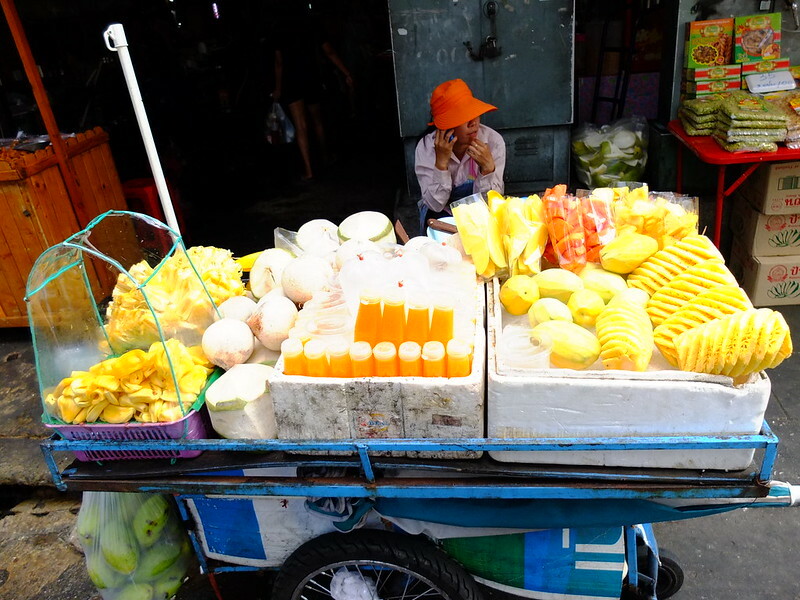 There are plenty of iced sliced fruit to eat for 20 THB. Sweet mango, papaya, dragon fruit, watermelon and pineapples, all peeled off and sliced, laying in huge amounts of crushed ice. You should also try the egg and banana pancakes, the coconut water, and all the fruit juices at hand. You’ll also feel the need to drink insane amounts of water. We went to Thailand in March and the heat was intense! Fortunately, water was everywhere, you can buy them at any 7 Eleven scattered all over Bangkok. A big water is only 13THB, the same price we buy them in Portugal, plus, you can buy them cold. It’s also a good excuse to break your 500 or 1000THB bills. Talking about money, there are ATM machines available everywhere, so no need to worry. But they’ll all charge you a 200THB fee for every withdrawal. To that, don’t forget to add your own bank’s fee. I believe we’ve all heard about the famous Thai sympathy. Locals do have a constant gentle smile on their faces, especially to foreigners, but they’re also quite reserved. This narrowed our interactions to vendors and merchants, and according to our experience, they’ll drop the smile as soon as you drop the money. Maybe you’ll get a robotic ‘Bye’ at the end. 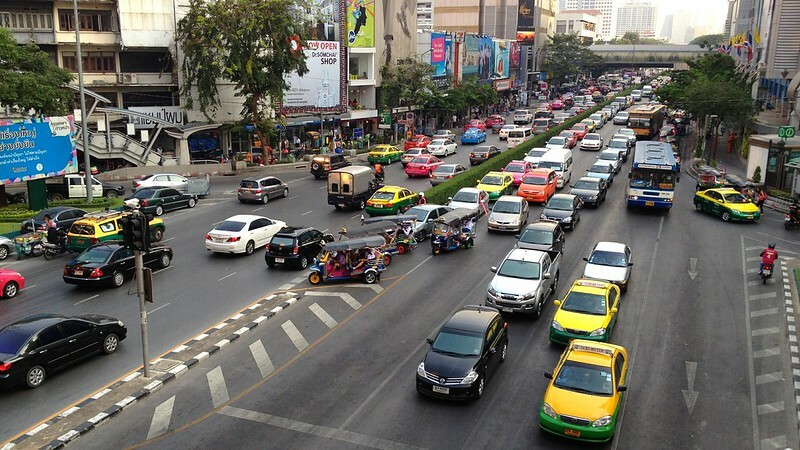 But maybe that’s just in Bangkok. By the way, we ended up finding the Big Standing Buddha by ourselves. Couldn’t understand what was the fuss all about.